Jeff K. Brown – Logan Logan & Watson, L.C. Jeff has extensive experience serving as lead counsel in a wide variety of professional liability cases throughout Kansas and Missouri. Over the course of his practice Jeff has represented physicians and medical practice groups in nearly every specialty. He has also represented numerous hospitals, rehabilitation facilities, long term care facilities, assisted living facilities, independent senior living communities, mental health facilities, mental health providers, physician assistants, advanced practice nurses, registered nurses, and licensed nurses. Jeff is also experienced in the representation of doctors of podiatry, osteopathic medicine, correctional medicine, chiropractic medicine, and ophthalmology. Jeff has successfully defended clients in the complete spectrum of medical negligence actions, including those involving claims of catastrophic injury and/or death. 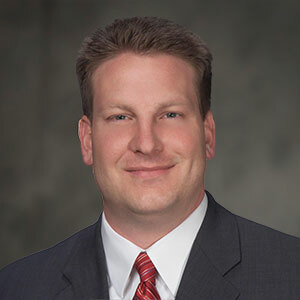 Jeff’s experience in defending traditional medical malpractice claims naturally led to the development of a practice that also is focused on defending skilled nursing homes and other senior care facilities. While his medical negligence background provides the ability to analyze and defend the medical and nursing issues in long-term care cases, Jeff recognizes that there are specific areas of concern for long-term care facilities that significantly differ from those presented in a general negligence and medical malpractice case. Applying this knowledge Jeff has been successful in representing numerous skilled nursing, assisted living, and independent living facilities in cases involving allegations of: wrongful death, failure to properly manage/monitor/treat a resident’s condition, medication errors, resident falls, pressure ulcers/stasis ulcers, staffing issues, treatment errors or omissions, use of restraints, use of bedrails, wound care, elopement, failure to follow doctor’s orders, consumer protection act claims, and state regulatory claims. Jeff also has an in-depth understanding of the unique operational issues facing long-term care providers, including the regulatory, litigation, and insurance atmosphere in which our clients operate. We defend our long-term care industry clients at every stage, including investigations of hotline complaints and surveyor citations, incident investigations, evidence gathering and ongoing facility evaluations. The combination of experience as a trial attorney and the understanding of the long-term care industry are invaluable in successfully defending clients in this high-dollar litigious climate. Perhaps just as important, Jeff helps assist clients in identifying potential quality control issues and works with them closely to provide information about how to avoid future claims, and ultimately lower costs. A former native of Newton, Kansas, Jeff now lives in Olathe, Kansas with his wife and two sons.